Let’s say you want to design a weaving pattern but don’t know how to go about it. First let’s decide what kind of pattern you want to design—a textured pattern or a figure (e.g. heart, diamond…). First of all—and this is easy to overlook; I often make the l-to-r mistake when I forget to pay attention to what I’m doing—READ ROW INSTRUCTIONS LEFT-TO-RIGHT ON EVEN ROWS, RIGHT-TO-LEFT ON ODD ROWS. 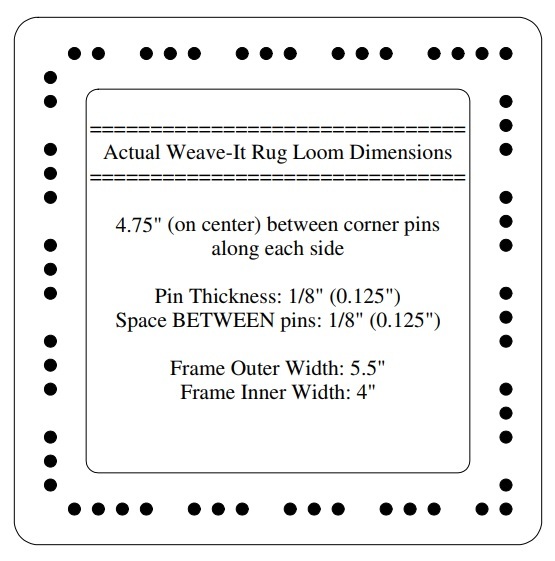 If you want to build your own pin loom(s), my husband designed a number of templates in various sizes with the “standard” 1/8-inch spacing. He has also included some with different space measurements between the pins (see individual patterns for pin spacing information). Example of a template. Please MEASURE your printout to make sure it’s printed the correct size.